The purpose of this walkabout is to sell a few assets and to shift their value to the newly founded compound. Not being the beneficiary of family wealth or other extraordinary means, this is simply what one does. F. Scott Fitzgerald said that you could be either rich or fascinating. He didn't say what happened when you were neither. In between the hassle of business, I thought about that. The rich do things for a thrill for the sake of the thrill, not for the sake of purpose or the demand of state. They are above the crude discipline that is required of warriors because of the nature of the game. You can still be a warrior and past your prime. At least that's what I tell myself. It's more of an attitude than it is a condition if you take the whole thing seriously. I don't know how serious I am about it. I never did the knife hands conditioning thing where you turn your knuckles into calcified rocks and your fingers literally into knives. If I had done it, I'd have been stove up with arthritic hands by now...get my point? How much of a warrior am I really? It's easy to talk about but committing to it is more challenging. 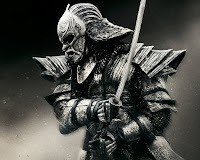 The great samurai, Miyamoto Mushashi said that it was necessary to lose self and become one with Mu, the emptiness at the heart of existance to which everything returns. Thus the warrior finds life in death. The experience may be sort of a Nietzche thing where, "when you look too long into the void, the void also looks into you." However it's true that warriors can not worry about their lives and still be effective. Maybe that is what Mushashi was alluding to? Skydiving at night offers that leap into the void, gripped by gravity's tug. Civilians don't jump out of airplanes at night. It's an activity that is only taken by warriors. I did it over Brown Field with Tijuana on one side and San Diego on the other with the lighted border fence as a demarkation line. As interesting as that is, the Mu event is jumping out of an airplane over the ocean at night. Twelve and a half grand above the featureless ocean, and even if it's a platoon going off the ramp, you still feel as if you're the only one. The way of bushido requires that the warrior divorce himself from desire. Meditation provides the connection to the egoless self. In Hagakure, Tsunetomo writes that there is deep power in the solitary man. I've heard it said that you need to lay on the beach and match your heartbeat to the breaking waves. I tried it. The zen of the thing is to try and find space between spaces. But what happens when you find it? My Buddhist friend (a hermit of sorts) lives in a cave in the Mojave Desert and is building a shrine to emptiness or some such. Is that what you do when you find space between spaces?